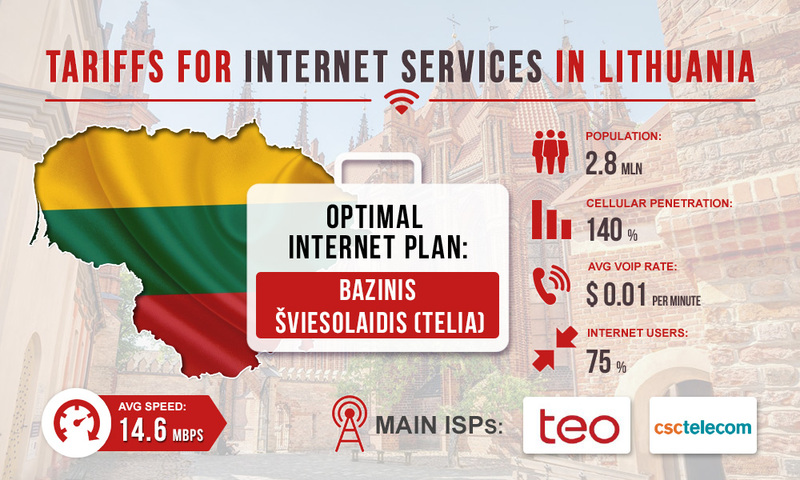 The Lithuanian telecommunications market is well developed; it is considered one of the most developed among European countries. With the poor condition of the fixed-line sector, the mobile segment is booming. There are many opportunities for profitable termination of GSM calls in Lithuania, including good Internet with high data transfer rates. All we have to do now is to calculate the terminator’s monthly business expenses to maintain a stable Internet connection. Telia's new generation broadband Internet. It is proposed for areas where fiber optic Internet cannot be connected. The clients can choose a suitable option from three Internet plans: Mega (Speed - up to 250 Mbps, cost— $19.8 a month, Wi-Fi router for wireless Internet is additionally provided), Maxi (Speed - up to 100 Mbps, cost— $14.6 a month, Wi-Fi router for wireless Internet is additionally provided), Midi (Speed - up to 19 Mbps, cost— $10.2 a month, Wi-Fi router for wireless Internet is additionally provided). Fiber optic Internet. The offer is available in thee options of Internet plan: BAZINIS ŠVIESOLAIDIS (Speed - up to 100 Mbps, cost — $11.2 a month), OPTIMALUS PLIUS (Speed - up to 300 Mbps, cost — $15.7 a month), PREMIUM ŠVIESOLAIDIS (Speed - up to 1 Gbps, cost — $22.5 a month). 4G-based hybrid Internet. Speed - up to 100 Mbps, cost $21.5 (special offer valid as of January 2019). An excellent choice for operation of ip voice traffic termination equipment will be BAZINIS ŠVIESOLAIDIS Internet plan. Fiber-optic Internet is the most stable and your expenses to connect it will be minimal. At the same time, you will get the high speed required for efficient performance of gateways.